Great personalities such as Katie Piper, Jessica Wright or Danny Jones, as well as footballers, Mamadou Sakho, Callum Wilson, Andy Carroll, Carlton Cole, James Tomkins, Oumar Niasse, Oumer Niasse, Adebayo Akinfenwa, or Marlon Harewood between Many others attended the event to raise funds and make a difference in the lives of children and women around the world. 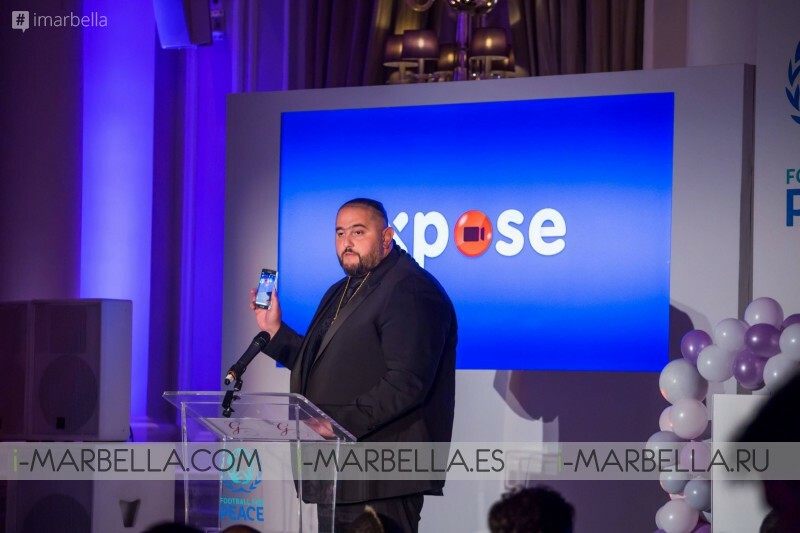 The Official Sponsor of the gala, Fadi Khalil, had the opportunity to speak about his contribution to make this world a safer place: "Xpose is an application for security, just by shaking the phone it activates and records what happens to your around ... And automatically the application will call 911. It is security for children and for everyone (...) ". Between the lots that more success had of the auction was the picture of the artist Sacha Jafri, that reached the number of 155,000 pounds, and a concert of Andrea Bocelli that reached the 9,000 pounds. Among the performances were the group Jack Pack, the wizard Richard Jones and DJ Josh Parkinson. The masters of the ceremony were the star of British television, Jessica Wright, and the young presenter, Braydon Bent. For his part, footballer Wilfried Zaha received the "Global Gift Philanthropist Award" for his action of donating 10% of his monthly income to charities. The football legend, Harry Redknapp, who was unable to attend, was honored with the Global Gift Humanitarian Award, and his friend Jeff Mostyn, president of Bournemouth AFC, picked up the award on his behalf. "At the Global Gift Foundation, we recognize the importance of supporting women and children, as well as the less privileged (...) it is an honor to work together with an organization like Football for peace, which promotes messages similar to ours, messages of unity and diversity at a time when we must all unit" explained María Bravo in gratitude with the sister foundation. For his part, Kash Siddiqi commented: "In Football for Peace we believe that women have a fundamental role to play in this field: behind every great success there is always a strong woman! And tonight is no exception, María Bravo and I share an incredible vision "
The Official Sponsor of this first edition of "Football for Peace By Global Gift" was XPOSE, but it also had the sponsorship and support of Corinthia Hotel, Maupy Worldwide, East of Eden and TFC. It is a non-profit charitable organization Created in 2013 by the entrepreneur and philanthropist Maria Bravo, whose objective is to create positive changes in the development, welfare, hospital care and social inclusion of the most vulnerable. The Foundation helps provide shelter, food, education, medical and hospital care, and other vital needs to vulnerable groups, particularly children and women in vulnerable situations. Football for peace is a movement that unites people and creates understanding; empower communities to be more tolerant and resilient through football that seeks to address the division, gang culture, violence and negative attitudes that exist in our communities and cities. By connecting people through football, we offer an alternative to the division. We save lives from being wasted in crimes of hate, violence, and extremism by offering hope in the face of prejudice and alienation. Whose dress was Eva Longoria wearing at the gala?